Luitzen de Boer was born on January 22, 1970 in Leeuwarden, the Netherlands. After completing his secondary schooling in Leeuwarden in 1988, he went on to study Industrial Engineering at the University of Twente in Enschede. During his studies, he developed a particular interest in business applications of Operations Research techniques. He wrote his master’s thesis on the development of a decision support model for inventory and production control under a hierarchical planning structure in the semi-process industry. Shortly after Luitzen had earned his M.Eng. degree in 1994, he took a PhD position in the NEVI Chair of Purchasing Management and Operations Research held by Professor Jan Telgen at the University of Twente. In addition to this thesis, the PhD research also resulted in several scientific publications in various international journals, contributions to (international) conferences and many articles in the Dutch professional literature on Purchasing Management. Since 1996 Luitzen de Boer has also been employed as an assistant-editor of Praktijkboek Professioneel Inkoopmanagement, a Dutch handbook for purchasing professionals. Following his work on this thesis, Luitzen de Boer continued his career at the University of Twente where he is presently employed as a postdoctoral researcher. 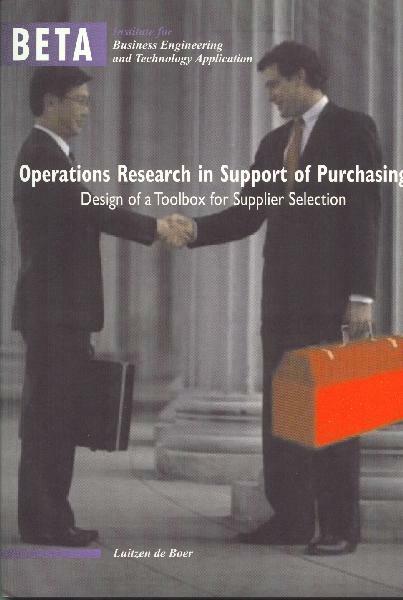 His research covers purchasing in general and methods and techniques for supporting and organising purchasing decision making in particular.